Researchers from the CMS and LHCb experiments at CERN’s Large Hadron Collider presented measurements of the decay of a Bs (pronounced B-sub-s) particle into two muons, putting the Standard Model of particle physics to one of its most stringent tests to date. After a quarter of a century of searching, physicists have discovered a rare particle decay that gives them an indirect way to test models of new physics. Researchers on the CMS and LHCb collaborations at the Large Hadron Collider at CERN announced today at the EPS-HEP Conference in Stockholm, Sweden, that their findings agreed closely with the Standard Model of particle physics, ruling out several models that predict new particles. In this result, physicists showed for the first time enough evidence to declare the discovery of a decay of a particle made up of two kinds of quarks—anti-bottom quarks and strange quarks—into a pair of particles called muons. The U.S. Department of Energy’s Fermi National Accelerator Laboratory serves as the U.S. hub for more than 1,000 scientists and engineers who participate in the CMS experiment. DOE and the National Science Foundation support involvement by about 2,000 scientists and students from U.S. institutions in the LHC experiments CMS, ATLAS, LHCb and ALICE—the vast majority participating at their home institutions via a powerful broadband network that ships data from CERN. The Standard Model predicts that the particle, called B-sub-s, will decay into two muons very rarely, only three times in every billion decays . However, the Standard Model assumes that the only particles involved in the decay are the ones physicists already know. If other, unknown particles exist, they might interfere, either making the decay happen more frequently than predicted or effectively canceling the decay out. What scientists found was a decay that followed the Standard Model’s predictions almost to the letter. This spells trouble for several models, including a number of models within the theory of supersymmetry, which predicts that each known particle has an undiscovered partner particle. But the hunters of new particles have not lost hope; the result leaves room for other models of physics beyond the Standard Model to be correct. The analysis is a tour-de-force for the two LHC experiments, which needed to eliminate an enormous amount of background information generated by other particle decays that mimic the decay they were looking for. The latest results from searches at the ATLAS experiment at CERN and the CDF and DZero experiments at Fermilab are consistent with the results from the LHCb and CMS experiments. As much as scientists can learn from measuring this decay, they can learn even more if they compare it to the decay of another particle made of quarks: B-sub-d, which is made of an anti-bottom quark and a down quark. A B-sub-d particle should decay even more rarely into a pair of muons than a B-sub-s particle. Physicists did not have enough data to make a definitive statement about this decay in this analysis, but their work shows that they will be able to gather evidence of it after the LHC restarts in 2015 at higher energy. 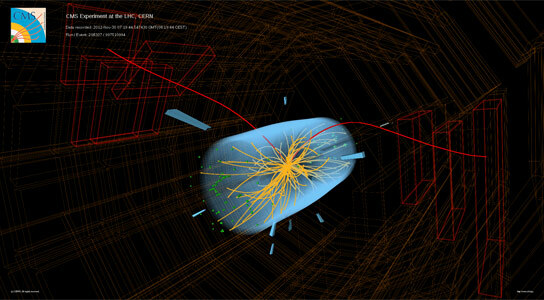 4 Comments on "Discovery of Rare Decay Puts Standard Model to Stringent Test"
Barking up the wrong tree..bs as it is. Sorry but the entire model is having a problem. The math works quite well but we must begin to realize what and where matter is//begins. The problem is one of misunderstanding what a photon is and how it transforms into an electron. An electron is a circle of symmetry between two or more photons which become locked into an orbit. This orbit travels at the speed of light, sometimes a little more and sometimes a little less, as a wheel spinning toward you, one side is faster another slower in relation. The universe is not expanding, everything contracts, cools, gets smaller, us included. The definition of a photon would be that it gets smaller the further from the source.. Smashing protons is like smashing eggs and calling each broken piece especially unique, please, lets embark on some learning! Brian, I like that you are looking at things differently. It makes sense that matter could be contracting while we see space as expanding. I have wondered about that myself. Yes, the standard model seems to be in a spiral of increasing problems. Unfortunately there will no doubt be lots more time spent smashing particles into smaller particles. Most scientist probably have higher IQ than the average person, but nevertheless they seem just as prone to mistakes as the average person. Supersymmetry can be saved by the introduction of entanglement of each individual particle with a so called anti-COPY Multiverse particle. Then the choice of Schroedingers Cat is clear. The universe is a set of entangle Pinball machines with the same quantum choices. Brian obviously has not studied the American waist line.